This is Harley an 11 yr old female. We adopted a kitten, Snuffy, from the shelter for companionship but, she was NOT having it. Harley was an only cat for years and intended to let Snuffy know she was the alpha cat in the house. After trying several attempts to have them bond.... no success. 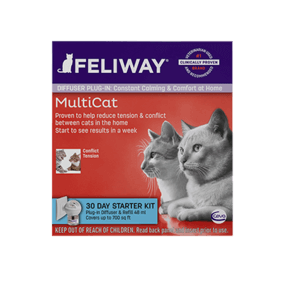 I saw FELIWAY MultiCat at my vet and tried it. Success!! After one month they were best buds. It's well worth it. I definitely would reccomend this product. Kudos to the product. It works.